My son has grown a new appendage over the past couple of weeks. It’s called the Woolworths’ Activity and Collector’s Album, and it has seemingly become an extension of said child. But that’s perfectly fine with me, as he’s gaining so much from collecting the animal cards – as are thousands of kids across Australia. Let me introduce you to my five-year-old, Oscar (that’s him at the top of the post). 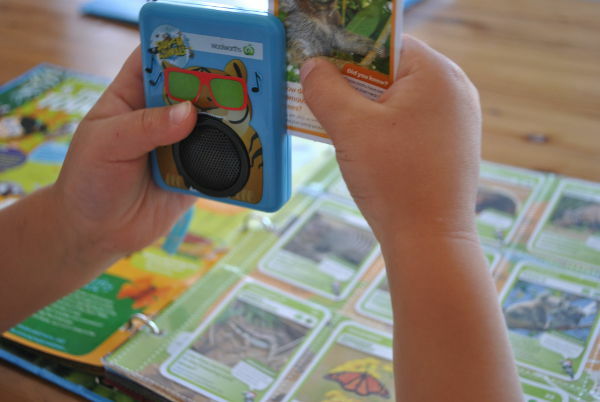 He’s a budding scientist/marine biologist/entomologist/Octonaut, therefore each time Woolworths has released a set of animal cards, he’s gone into animal-lover overdrive. But the latest collection – Super Animals, has sent him into a whole new stratosphere. If you’re one of the few who doesn’t have children collecting the cards, let me tell you that this latest set has upped the ante in a big way. 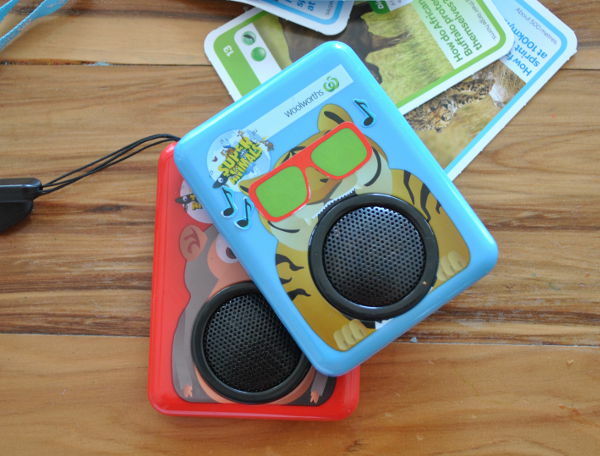 These cards come to life, with the help of a cool little gadget available from Woolworths. 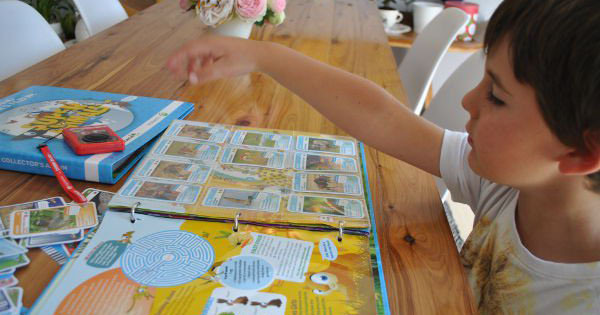 So, why do we love the Woolworths Super Animal Cards so much? Firstly, I really love that they’re good, clean fun. There’s something wholesome and innocent about the simple task of collecting, and swapping cards to create a set. It’s something our grandparents used to do, in a much simpler time. And the swapping part is a fantastic way for kids to learn about sharing, giving and receiving. When Oscar gets a new bunch of cards, he immediately goes through them to see which ones he can give his brother and kinder buddies. Woolworths has also created a great Swap Zone, so kids can connect and try and complete their collections. The educational aspect of these cards can’t be underestimated. While Oscar is still learning to read, it’s only taken me going through the album with him once for him to be able to recognise which page says the fiercest animals, or the fastest. 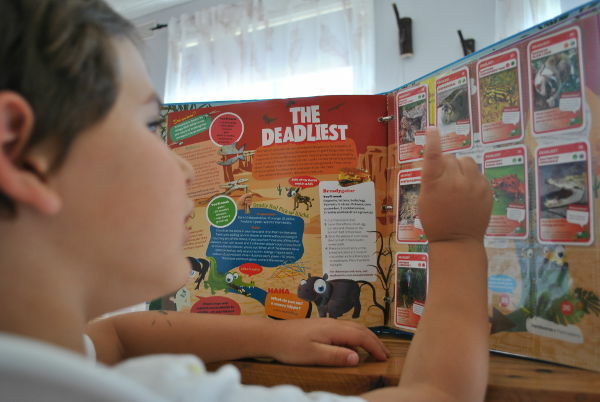 We also spent some time going through the page of threatened animals and what that means. I’ve then heard him relay this information to his grandparents. We actually picked up our album and first few cards in Queensland, as we were about to set off home to Victoria from a road trip. It was a godsend! 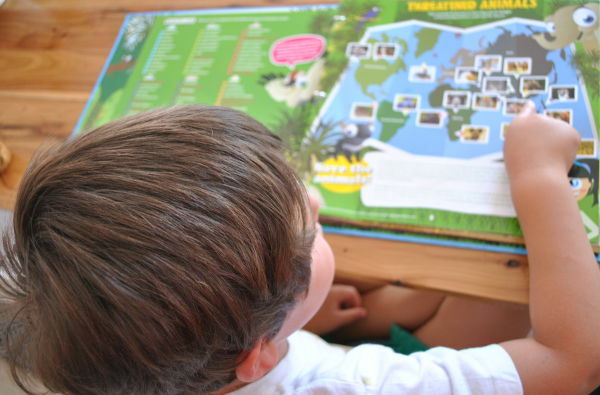 The album and cards took precedence over the smart devices and DVDs, and he spent a lot of time matching the number of the cards to their correct spot – another great learning tool. Each morning Oscar emerges from his room with his album under his arm, ready to tell me something else he’s spotted. It’s incredible that a child can garner so much information from something that is rather static, compared to what this generation of children is used to, in terms of technology. The cards and album have continued to pique the interest of my aspiring David Attenborough, who has a seemingly insatiable thirst for knowledge of the creatures that inhabit the world. That’s why I am waxing lyrical about these rather innocuous cards. To adults they may just be pieces of card, but for children they open up a whole new world of sights (and sounds, thanks to the card reader – which can be decorated with the stickers provided, a la Oscar’s above). 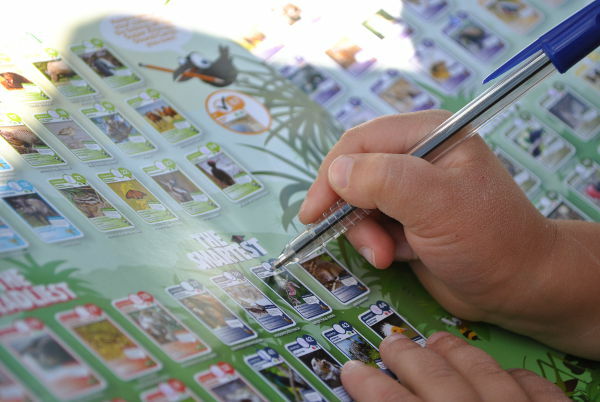 If you’re yet to jump onto the Woolworths Super Animal Cards bandwagon, here’s the low down. You get a pack of four cards free with every $20 spent in-store or online at Woolworths. You can grab an album for just $5, and 50 cents from each one sold goes to the Taronga Conservation Society Australia to support their vital programs. We also grabbed a couple of Super Animals Colouring and Activity Books ($3 each) and they have been very popular with both of our boys. Other items in the Woolworths Super Animals range include a collector’s tin ($2 each), height chart ($3 each), melamine plates and bowls ($3 each) and tumblers ($2 each). 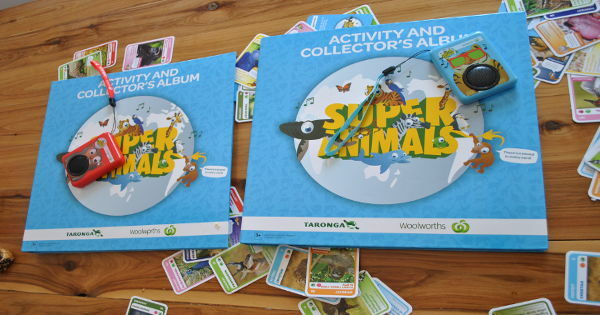 Also, you can receive free entry for a child to Taronga Zoo Sydney or Taronga Western Plains Zoo Dubbo when a completed Super Animals Activity and Collector’s Album is presented at the ticket desk, until 30 June 2015. 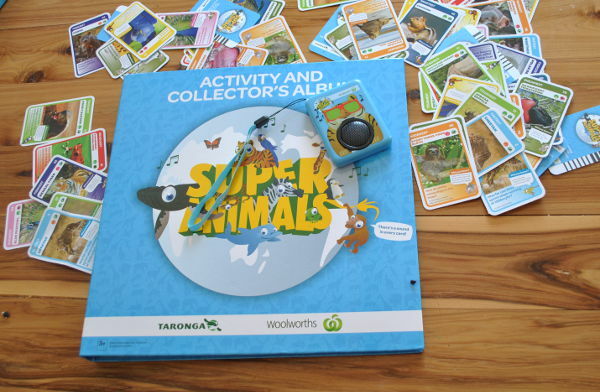 Are your kids as enamoured with Woolworths Super Animals Cards? And how are they going with their collections?